09 JUL 1943 – Operation HUSKY, the invasion to liberate Sicily, began. Eight divisions were involved – more than 80,000 men. 10 JUL 1950 – The first engagement between U.S. and North Korean tanks occurred near Chonui, Korea. 11 JUL 1972 – American forces broke the 95-day siege at An Loc in Vietnam. How many SigEp Patriots were present at these important moments in U.S. military history? The SigEp Patriots Project (SPP) thinks it is important to know, and we continue to work to learn the answer to this and many other questions. On this date, NC Epsilon Brother Robert L. Orr entered the U.S. Army, and went on to serve in the Army Corps of Engineers during World War II. MA Alpha Brother David H. Johnson joined the U.S. Coast Guard on this date, serving as a Soundman Second Class during World War II. World War II Veteran and AL Beta Brother First Lieutenant James Calabra, Jr., U.S. Army was discharged from the service on this date after nearly three years in the Army, and 17 months in the China-Burma-India Theater with the 3286th Engineers. On this date, World War II Veteran, future SigEp Citation Recipient and VA Zeta Brother General Robert Jefferson Wood, U.S. Army (Retired) – one of five known SigEp Patriots to reach this rank in the U.S. military – died of a stroke at the Veterans Administration Hospital in Washington, DC. 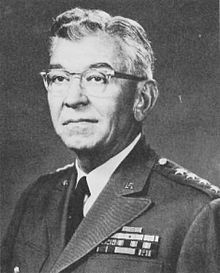 Brother Wood was a United States Army four-star general who helped organize the creation of the North Atlantic Treaty Organization (NATO) military organization in the early 1950s and served as director of the military assistance program from 1962 to 1965. Born in 1905 in Petersburg, Virginia, he attended Randolph-Macon College for a year until entering the United States Military Academy in 1926. On 12 JUN 1930, Brother Wood graduated and was commissioned a Second Lieutenant, U.S. Army Coast Artillery Corps. During World War II, he served in the Mediterranean Theater, advancing through the grades from Captain to Colonel. Following the war, Brother Wood served as a military aide to Secretary of Defense and NH Alpha Brother James Vincent Forrestal. Following an assignment to the Advanced Planning Group charged with creating Supreme Headquarters Allied Powers Europe (SHAPE), the NATO headquarters organization, Robert was promoted to brigadier general in MAY 1952 and assigned as Chief of the Defense Annual Review Team for the U.S. Mission to NATO. On 01 MAY 1956, Brother Wood became commanding general of Fort Bliss (Texas) and commandant of the Antiaircraft Artillery and Guided Missile School. With his promotion to Lieutenant General in 1960, he was assigned as Commanding General of the Army Air Defense Command (ARADCOM) in Colorado Springs, Colorado, and two years later appointed director of the military assistance program in the office of the Assistant Secretary of Defense for International Security Affairs, with the rank of full general. The Director of Military Assistance supervised the operational details of arms transfer to NATO allies and other friendly countries. As chief of staff of the foreign military aid program, he was considered to be on the same level as the chiefs of staff of the Army, Navy, and Air Force and of comparable military rank, but without a seat on the Joint Chiefs of Staff. Robert retired on 01 SEP 1965, but was recalled to active duty in 1968 to serve as Director of the Overseas Base Requirements Study Group, a special interdepartmental study group planning future overseas military base locations. With his work completed, he returned to retired status on 31 MAR 1969. He subsequently served on a presidential task force on international development. His awards and decorations include the Army Distinguished Service Medal, Legion of Merit (with oak leaf cluster) and Purple Heart. U.S. Marine Corps Veteran MO Epsilon Brother King Albert Hagey III died on this date in Bristol, Virginia. King served in the Corps from 1958 to 1959 before attending college and graduating in 1961. Born in Bristol in 1937, he graduated from Bristol Tennessee High School in 1955 before joining the Marine Corps. After earning his Master of Arts in biology, he worked in medical research at the Veterans Administration Medical Center in Nashville, and retired after 30 years of service. After retirement he returned to Bristol to live and care for his father. He was a member of Chapter 39 of Disabled American Veterans. Respect can be paid to Brother Hagey at Glenwood Cemetery, Bristol, TN. U.S. Army Veteran AZ Beta Brother Eric Whiting Fields, 62, died on this date. Born in 1947 in Mishawaka, Indiana, after earning his bachelors degree from University of Arizona, Eric received a masters degree from The University of Missouri, and subsequently taught at several universities. He was involved in numerous ministry positions, including board director for the Emporia Kansas Salvation Army. For 16 years, he was a devoted field account manager with Spring Arbor Distributors. Respect can be paid to Brother Fields at Memorial Park Cemetery, Memphis, TN. On this date, TN Alpha Brother First Lieutenant Thomas Joseph Williams, Jr., U.S. Army National Guard (Tennessee), 26 of Nashville, Tennessee, died when the OH-58D Kiowa he was piloting crashed near Caryville, TN during a training flight. He was assigned to Troop C, 230th Air Cavalry Squadron. 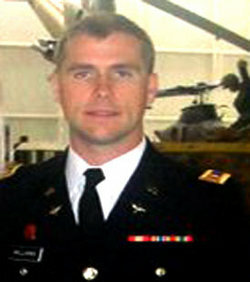 Thomas joined TN Alpha during his freshman year at UT, and was also a member of the University of Tennessee ROTC program. Born in Nashville in 1985, Thomas graduated from Hillwood High School in Nashville, and entered the University of Tennessee - Knoxville, where he graduated in December 2007. In addition to his military service, Brother Williams was owner and president of Southeast Investment Group, which he started in 2009 in Knoxville, specializing in real estate sales and investments as well as construction and project management. He was especially proud and loved restoring and renovating older and historic homes, particularly the Victorian houses in the World's Fair Park area in Knoxville. He returned to the UT Army ROTC program in 2011 as an assistant professor of Military Science. Respect can be paid to Brother Williams at Harpeth Hills Memorial Gardens, Nashville, TN. OH Gamma Brother Second Lieutenant Randal Scott Dudis, U.S. Army (Veterinary Corps) was commissioned on this date. Vietnam War Veteran and GA Epsilon Founding Father First Lieutenant Herbert Anderson “Andy” Wall, Jr., U.S. Air Force, 66, died on this date after a courageous battle with ALS (Lou Gehrig's disease). He was born in Charleston, SC, grew up in Ridgeland, SC, and had been a resident of Bulloch County since 1974. Andy received his bachelor's and master's degrees from Georgia Southern University. He taught social studies and German language in the Bulloch County School System and retired from education in 2004. Memorial contributions may be made to Ogeechee Area Hospice, P.O. Box 531, Statesboro, Ga. 30459, or to the Statesboro First United Methodist Church Building Fund, P.O. Box 2048, Statesboro, Ga. 30459. Respect can be paid to Brother Wall at Ridgeland Cemetery, Ridgeland, SC. In addition, this time last year we were welcoming home Operation IRAQI FREEDOM / NEW DAWN Veteran CA Theta Brother Lieutenant Commander Ian Marks, U.S. Coast Guard following his successful deployment to Kuwait. We were also congratulating VA Omicron Brother First Lieutenant Andy Ryan, U.S. Army on his marriage, PA Gamma Brother Charles Brand for receiving his U.S. Navy commission, AL Zeta Brother Daven Bailey for graduating from the Army’s Leadership Development and Assessment Course, and celebrating the successful completion of Marine Corps Officer Candidate School by KY Epsilon brothers Brentt Mcgee and Zachary Tkach, CA Omega Brother Tyler Sweet, and PA Gamma Brother Doug Upton, that latter who graduated in the top 10% of the class. Our thoughts and prayers go out to the family, friends and chapter brothers of SigEp Patriots Leposa and Lewis. While they are gone, SPP pledges they will never be forgotten. Congratulations to Brothers Alvarez, Callas, and Weis! Best of luck in the next step of your military career!